Each year, approximately 25,000 people attempt to climb the 5,895 meter Mount Kilimanjaro - Africa’s highest summit and the world’s highest free-standing mountain – around half of whom don’t succeed at reaching the summit. Although the climbing motives may change, almost everyone wants to reach the summit. Many elements contribute to the success or failure of summiting Mt Kili: how physically and mentally prepared you are, the gear you’re using, the professionalism of the tour operator, the days spent on the mountain, and quite importantly, the route you choose. Today, there are seven treaded routes up Kilimanjaro to choose from, and well, all roads lead to the summit. Although there is no ultimate ‘best’ or ‘worst’ choice – only the best suited for your capacity – you need to bear in mind the cost, length, and difficulty of the trail among other variations. Still overwhelmed and don’t know where to start? Here’s a breakdown of the different routes up Kilimanjaro for an easier, clearer decision making process. Taking on Kili from the south-east side, the Marangu trail is one of the oldest, most established trails on the mountain. 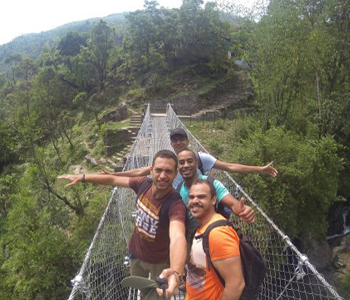 It is also known as the ‘Coca-Cola’ route because it’s the only trail where you can buy soft drinks and candy bars. Having grown a reputation for being the easiest route, Marangu trail attracts more tourists than well prepared trekkers (granting it its other nickname, the ‘tourist’ route), which partially explains the low summiting success rate. The reason Marangu is perceived as an easy route is because it gains elevations quite steadily and gradually – that is of course only true until a day before the summit day. Being the only route that offers dormitory style huts, Marangu trail is heaven-sent for hikers who unwaveringly refuse to camp out in the wilderness. Mind you, all you’re really getting is a mattress and a pillow; don’t expect anything fancier. The huts also come in handy in the wet season, shielding you from any rains. With camping being banned on this trail, you get to trek with less equipment, which means you need fewer porters accompanying you, reducing the overall cost of the climb. Despite being one of the least scenic routes, Marangu trail hosts around 40% of the trekkers. If you decide to climb up the Marangu trail, you should expect heavy traffic. What makes the traffic even denser is that it’s the only route that goes up and down the same path. Another reason why some people will steer away from Marangu is that after the steady, gradual elevation gain, the last day before the summit day gains steep elevation that take you to a 1000 m elevation in one day, followed by another 1200 m to the summit the following day. With very little time to rest and properly acclimatize, many hikers back down before the summit because of altitude sickness. However, opting for the six-day option could enhance your chances at making it to the summit. As opposed to its counterpart, the ‘Coca-Cola’ trail, the Machame trail is known as the ‘whiskey’ trail, denoting its higher difficulty. Departing from the south-west side of the mountain, the trail follows the Southern Circuit, following Barafu and Stella Point to reach Uhuru peak, and then descends through the Mweka route – which is only used for descent. A wise thing to do is to go for the seven-day plan, which ensures your pre-summit day is short enough to rest and acclimatize. You should know by now what that means; better chances at summiting! Walking you through the Shira Plateau, the Lava Tower, and the Barranco Wall, the Machame route is one of the most scenic trails on Kili, which is certain to make the effort worthwhile. With even more crowds than on the Marangu trail, Machame trail is the favored choice for 45% of the Kili climbers. It gets even busier at the Barranco camp where the Shira, Umbwe, and Lemosho routes intersect with the Machame route. Even though it’s not technically hard, it’s strenuous. Unlike the steady, gradual slope of the Marangu route, the Machame route follows a succession of ups and downs that take you through several valleys and ridges. The Rongai route is the only route that ascends Kili from the northern side, followed by a descent on the opposite side via the Marangu route on the south-east. This north to south path takes its treaders through different sides of the mountain. The north face of Kili tends to be a lot drier, giving the Rongai route an advantage in the wet season, which could be an excellent way to avoid the rain during the first few days of the climb. Similar to Marangu, Rongai also gains gradual and steady elevation, sparing you the trouble of any steep climbs. Unlike Marangu and Machame, only 5% of the Kili climbers choose Rongai. Not only does this mean you get to enjoy some quiet, but also that there’s a slight chance you could spot some wildlife. With less demand on the trail comes less supply, which makes this trail a costly one. One common feature of less treaded trails is that budget operators are very unlikely to operate on them. Although the Rongai route goes from the north face to the south face of the mountain, it is not a very scenic trail. However, right beneath the Mawenzi Peak, the trail graces you with one of the best views on the mountain. The Shira route departs on the southern side of Kilimanjaro, joining Machame route at Barranco camp. With different variations to the route, a clever tour operator will be able to manage the stops and camping sites in a way that avoids the Machame route crowds as much as possible. The Shira route has one of the lightest traffics on Kilimanjaro, with only 1% of the climbers choosing it. The Shira route kicks off quite differently from other routes. On the first day, the trail follows a four-wheel drive track, which you can either walk (not a very attractive route to walk), or you cross in a car until the highest point possible. The drive option means skipping the rainforest area, and quickly rapidly reaching an altitude of 3600 m. If you’re not used to high altitudes, the lack of proper acclimatization could cause you altitude sickness. Similar to other unpopular routes, the Shira route is rather expensive. Considered to be a modified version of the Shira route, the two trails share plenty of features, including joining the Machame route at the Barranco camp. However, unlike the Shira route, the first couple of days on the Lemosho route take you through a remote rainforest where you can get a real feel of Kilimanjaro’s unscathed nature. Falling on the less treaded routes end, Lemosho is often favored for its sparse traffic, with only 8% of the Kili climbers choosing it. With less traffic comes higher chances of encountering wildlife, which may still not be that high, but not impossible. While it may not be the most scenic route of all seven, the Lemosho trail is still known for its spectacular scenery and panoramic views. Justified by the many merits that make the Lemosho route appealing, it comes at a higher price than many of its alternative routes, especially because of its length and little popularity. The Umbwe route is known as the steepest and most direct route. Before a 2006 accident, the route traditionally followed the Western Breach, whereas now, it joins the Machame route on the second night, following the Southern Circuit instead, and then descends via the Mweka route. 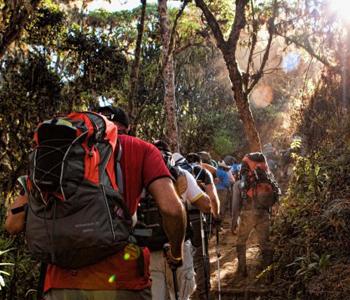 Similar to the Machame route, the Umbwe route departs from the south-west side of the mountain, breathing in the serenity of the rainforest before joining the Machame crowds. The Umbwe route is not a technical one, however it is very physically demanding. Like other trails that offer a five-day plan, five days on the Umbwe route will not give you enough time to acclimatize properly, which will put you at risk of altitude sickness. 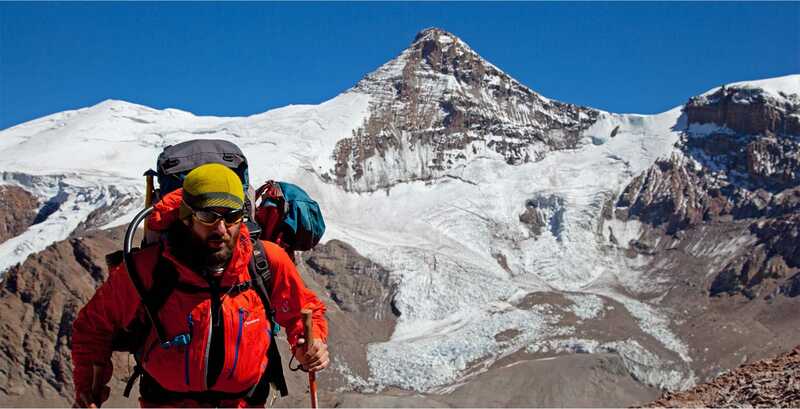 Furthermore, given the route’s terrain, it is considered the most demanding route, which requires previous trekking and climbing experience. The North Circuit route is the newest and longest trail on the Mt Kili. At the beginnings, the North Circuit route follows the Lemosho route, but instead of following it around the western circuit, it traverses instead around the northern circuit, taking an almost 360 degrees view of the mountain. Far from the various routes that traverse around the southern circuit, walking the northern circuit is guaranteed to be quiet and serene. And because it’s the longest trail on Mt Kili, it gives its trekkers the longest duration to acclimatize, which boosts the chances of reaching Uhuru Peak. The Northern Circuit route is among the most expensive routes due to the long days on the mountain, and accordingly the length crossed. 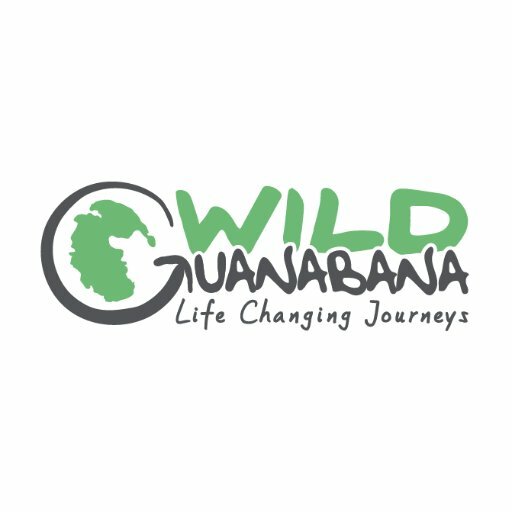 If you wish to trek Mt Kili with Wild Guanabana, learn more about our Machame trip here , or the Lemosho trip here.